Bring quick turnarounds, repeat rentals and superior ROI to your fleet with Little Wonder. Time is money and productivity pays. 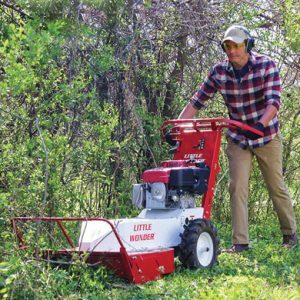 Customers will enjoy using Little Wonder equipment for debris clean-up projects, grounds maintenance or asphalt and paving prep jobs. The quicker the customer can get the job done, the quicker you can turn the tool and turn a profit! Little Wonder equipment is built for heavy-duty use. Quality components, productivity features and service and maintenance ease make it a favorite with rental dealerships world-wide. And Little Wonder equipment is designed to make every rental customer feel like a pro, with simplified control mechanisms and clear setting and adjustment levers. You can find Little Wonder equipment through national rental stores and independent rental shops nationwide. Visit our dealer locator to find a rental store in your area. For jobs that require hurricane-force air power, you need a Little Wonder walk-behind blower. Longer-lasting blades require less sharpening that on typical homeowner-grade hedge trimmers. Tackle unrelenting brush, saplings and overgrowth. Get the landscape under control. The power to take on big leaf and debris removal jobs. Create perfect edges and immaculate borders. Designed to carry twice the load of other debris vacuums.